It has been reported from Mingora, Swat that hundreds of people have started shifting to safer places after flood waters submerged several areas in Matta and Kabal tehsils of Swat district on Thursday. The floodwater entered Matta tehsil and affected 0.3 million people while 0.4 million residents of Kabal were forced to leave their homes due to flood. 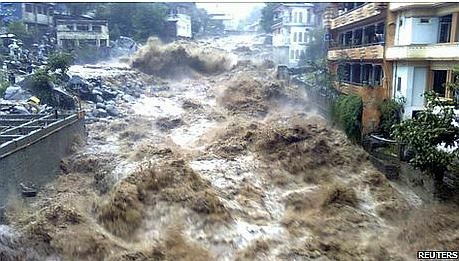 The authorities had issued flood warnings last Tuesday after water-level in Swat river increased to an alarming level.The flood victims of both tehsils were being shifted to safer places through remote Shamozai Barikot road and Baghdheri road, respectively, as several key routes were closed down.